Trachoma is an eye disease due to a very tiny bacterium, Chlamydia trachomatis, which, like viruses, only develops at the expense of living host cells. It is a keratoconjunctivitis which can end in blindness. The number of those affected by the disease in the world is estimated, in 1985, to be 500 million of which 7 to 9 million are blind. It is a disease that is transmitted directly through unclean hands. It can also be transmitted indirectly by flies which so often stick on the eyes of children in the tropics. Contamination occurs from early childhood. The geographical chart shows that the disease occurs in regions of extreme poverty, promiscuity and hygienic deficiency. During the first half of the twentieth century, the endemic is most powerful in Mediterranean Africa (the Maghreb, Egypt, Ethiopia), in India and in Brazil. Imported into Black Africa by means of trans-Saharan caravans, it then progresses along roadways and waterways. In Certain villages in the Sahelian region, 2 to 6 villagers in 10 are affected. The disease is rare in Madagascar. The Colonial Health Service attempted to fight this endemic. But, in the beginning, its means are very limited. After the Second World War, systematic detection is resorted to in order to establish a profile of the disease. In 1952 the Ophthalmologic Centre of French West Africa (Centre d'ophtalmologique de l'AOF) is created in Bamako. It will become l'Institut d'Ophtalmologie Tropicale Appliqué or IOTA. The fight against Trachoma is included among the objectives of the Great Endemics Service. Mass campaigns are organized. The World Health Organization has recently launched eradication campaigns with the detection and systematic treatment of patients. At the end of the twentieth century, the disease is on the decline. This regression is related to the progress in hygiene, living conditions and education. From a clinical point of view, it is a conjunctivitis which generates follicles, little growths spread over the surface of the conjunctiva of the upper eyelid (palpebra superior). Both eyes are affected simultaneously. The lesions only become visible after the eversion of this eyelid. Then the cornea itself is invaded (keratitis) and finally the tear-strip. The ailment evolves towards an internal cicatricial retraction of the eyelid which results in turning the eyelashes that have become rigid and brittle towards the eye (trichosis). The dryness of the cornea provoked by the drying up of tears together with this unceasing "brushing" of the surface alters the cornea which becomes opacified and ulcerated. The administration, at the same time, of sulphonamides through general inlets and antibiotics as an ophthalmic pomade during many weeks is efficacious but beyond the means of most people. At the present time, antibiotics administrated through general inlets have taken over from the sulphonamides but the necessity of concomitant hygienic measures and health education is emphasised. 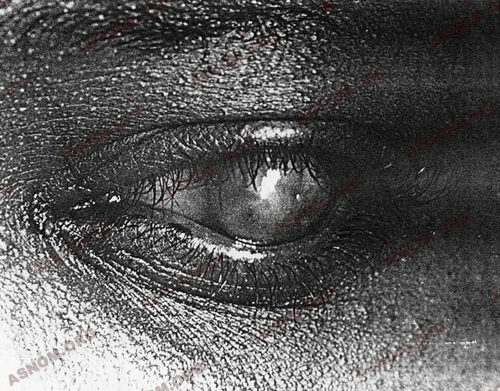 After the Second World War, Le Rouzic*, the Director of Health Service at the Ministry of French Overseas Territories (ministère de la France d'outre-mer) writes to the minister: "Even though the occurrences of Trachoma can in no way be compared to that of Malaria, of Trypanosomiasis etc. The importance of the fight against eye diseases has not been forgotten by the department". A total of 29 516 cases. In the case of serious trachoma, about one in every ten patients will become blind. - the development of the centre for documentation, research and studies. At the same time, the Colonial Health Service intensifies the training of specialists in Ophthalmology. In 1952 they are 19, spread over the colonial domain. On a practical level, from the creation of the IOTA, every physician who has to deal with the great endemics in the AOF learns there, as soon as he begins his appointment, the surgical technique that can be practised in dispensaries in order to prevent eyelashes turning inwards. By cutting off a strip ("un quartier d'orange") on the scarred eyelid, it is raised up and the rubbing of the cornea by the eyelashes is prevented as well as all the infectious consequences that can follow. Thus it was possible to operate many patients and stop them going blind. Following the methods of the Great Endemics Service, derived from the Jamot method, mobile teams are put into place in areas where Trachoma rages. 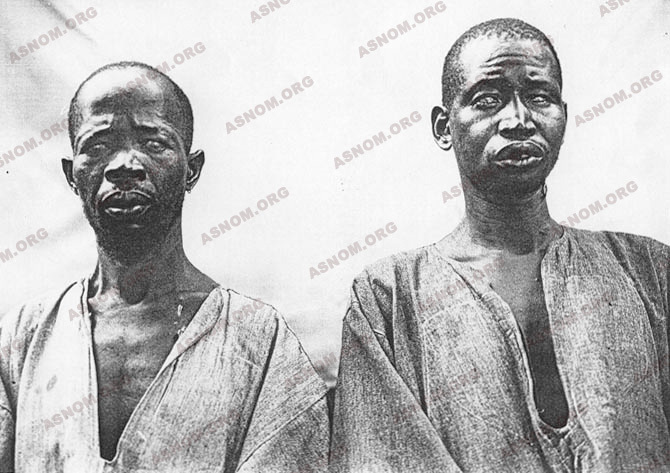 - Detection: Thus in 1955, in Cameroon, in the region of Logone and Chari, Cousserans* directs a mobile team in an area populated by semi-nomads. It is divided into eight sectors and includes nearly 400 villages. He disposes of two teams, each consisting of ten persons and provided with a lorry. Within six months 40 000 persons are examined. In the different villages, 6 to 14% of the inhabitants suffer from "eye disease", with a total of 1 600 trachoma patients, of which more than a hundred are likely to become blind. In 1956, Reydy* detects 507 trachoma patients among 5007 subjects examined in Chad (10 %). It is to be noted that, at the same time, the teams detect lepers and vaccinate the population. - The treatment : removing the little granular particles in the eyelids by means of a curette proves to be ineffective. This traumatizing procedure is often followed by infection. Rubbing the eyelashes with pieces of sugar was proposed. All these procedures lead to retractile cicatrisation of the eyelid. More harmful than efficacious, they have been abandoned. 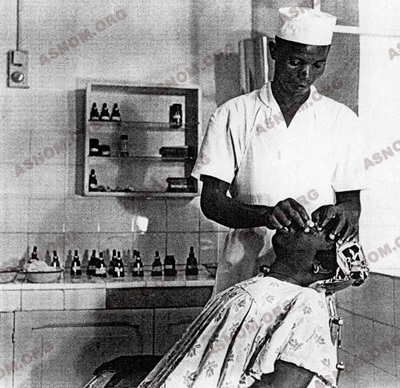 In 1955, following the instructions of the Director of Health, Beaudiment*, the mobile teams in Cameroon perform the rubbing of the conjunctiva with half a tablet of Dagenan (sulphonamide). A sort of white paste is produced that is easy to spread. It is applied, after washing the eyes, once or twice a day during six days. Then the nurse goes away. While it is there, the mobile team assures the spraying of insecticides in the huts in order to reduce the proliferation of flies and, thus, the transmission of trachoma. After the advent of antibiotics and with the progress made towards a better knowledge of the trachoma microbe, treatment was profoundly modified to attain its present efficacy. Antibiotics are prescribed to be taken orally or as ointments to be applied on the eyes. This treatment must go on for many weeks or months. It is efficient and cheap but difficult to put in place in underprivileged regions. After Independence, the OCCGE has taken over from the SGHMP. - Pichard E & Resnikoff S. : Trachome. Encycl. Méd. Chur. Paris. Maladies infectieuses. 8-037 G-10,1993,3p. - Védy J. : Précis d'ophtalmologie tropicale. 2° Ed. Diffusion générale des librairies. Marseille 1988.